The Ypsilanti Public Schools' Board of Education at the special meeting held Thursday to announce the administration's plan to restructure the district and close two schools. Mar. 19, 2010 · 3:42 a.m. The Ypsilanti Pubic Schools Board of Education will be voting Monday on a district restructuring plan that would close Chapelle Elementary and East Middle schools. Superintendent Dedrick Martin announced the administration's plan at a special board meeting held Thursday night to present the plan to the public. 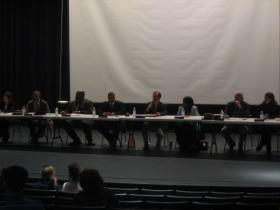 Approximately 100 people were in the audience at Ypsilanti High School to see the presentation and address the board. Estimated to save the district $1.3 million, the plan calls for “re-purposing” the two schools, combining first grade with kindergarten at Perry, offering kindergarten through sixth grade at Adams, keeping sixth grade at Estabrook and Erickson and housing seventh and eighth grade at West Middle School. The district needs to find a savings of nearly $5 million next year, according to the plan submitted to the state that outlines how the district intends to eliminate its more than $6 million deficit within four years. During his presentation Thursday, Martin discussed three other restructuring plans the administration had considered before making its recommendation. He said two of the plans were created through recommendations made by the community. He then covered positive and negative effects of closing each school in the district. The first community-recommended plan suggested closing Perry for a $445,000 savings. The second suggested closing East Middle School and splitting middle school grades between West Middle School and Estrabrook for a $825,000 savings. The administration plan not recommended Thursday night suggested closing two elementary schools in the district and splitting grades five through eight between the two middle schools for a $968,000 savings. As the elementary with the highest capacity, Martin said closing Perry would limit the district's ability to expand if necessary in the future. He also pointed to the many families attracted to the district because of Perry's Montessori program. Martin said splitting up four middle school grades between two schools would add another building transition between grades that could cause enrollment figures to drop. Martin said the plan recommended by administration offered several options to parents interested in having their children enroll with YPS. He said the Montessori program at Perry has been a successful recruiting tool and adding another grade would allow students to stay there longer and make the district even more attractive to families. He said the plan would build on the district's success with Perry. If enrolled in a pre-kindergarten, students could stay at Perry for up to three years. For families not interested in the Montessori program, Martin said Adams would serve as alternative for families that would like their children to progress through their elementary education without a building transition. Martin said the district loses a lot of students when transitioning to the middle school and he said keeping the sixth grade at the elementary level may help with the district's enrollment. Location may have been one of the largest factors in deciding to close Chapelle, as Adams and Erickson are uniquely located in their portion of the district. However, Chapelle is close to Estabrook, which Martin said closing would put the district too close to capacity and lose its already existing customization for physically impaired students. The administration was able to identify one negative and four positive effects of closing Chapelle, the least and most amount respectively of any district elementary school. While Chapelle has a strong community connection, Martin said the building was the oldest elementary building in the district with the lowest capacity. According to administration estimates, YPS is currently operating at 64 percent capacity with 2,644 students. The recommended plan would put the district at 81 percent capacity with 2,356. The lower enrollment in the plan next year is due to an anticipated drop in attendence from effects of closing buildings. In the plan, Estabrook would remain the most utilized building in the district, at 94 percent capacity. West Middle School would be the least utilized building, at 67 percent capacity. West Middle School is at 57 percent capacity now. Martin said parents at Chapelle will be able to request sending their students to any other elementary school in the district and administration will try diligently to fulfill those requests. He said open houses will be held in each affected building after spring break to educate families about how the transition into the restructured district will occurred. The word “re-purpose” has been used by YPS administration to describe a school being closed. Martin said the district could use the two buildings to house an expanding New Tech High School program from Ardis or county-wide special education programs from George. Approximately 20 people stood to address the board Thursday, including four district students. One student, in her last year at Chapelle before moving on to middle school next year, spoke about the positive experiences she's had at her elementary school. “If you close Chapelle down, all the younger kids won't have that experience,” the student said. Most parents spoke out against the plan, citing the negative impact closing schools has on enrollment, a lack of considering options that don't result in closing buildings, keeping sixth grade students at the elementary level for another year and moving further away from the neighborhood school model. Several parents also spoke in a positive light. Some thanked boardmembers for their time and commitment while having to make difficult decisions. Others pointed out the district is more than a collection of buildings and stated YPS could still provide a quality education during such economic hardship. The only boardmember to state their opinion on the matter was Kira Berman, who is against the plan. Berman said she didn't see enough rationale behind decisions like holding the sixth grade at the elementary level and said closing a neighborhood elementary school would do more harm to the district through enrollment decreases.